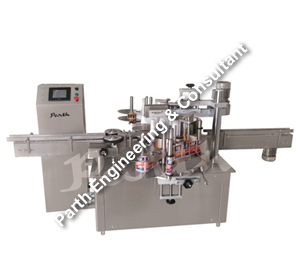 Wet glue labeling machine is used to label the container of the products and thus finds considerable application in countless industries. Our wet glue labeling machine is one of the most user-friendly labelling machines that one will ever come across. The labeler machine is capable of attending 120 containers per minute depending upon the size of the container. The mild steel structure cladded with stainless steel provides robustness thus increasing the endurance of structure. Glass, Plastic, PET bottle, Tin, Corrugated containers are all the materials for which the labeler machine has been deemed suitable to operate on. The time required for change over is very little and no replacements or adjustments are required in the wet glue labeler.